As part of a university-wide implementation of PebblePad, staff in Griffith Sciences now have access to a cutting-edge platform which they can use to engage their students in a variety of learning activities. PebblePad is an advanced commercial ePortfolio, and personal learning network platform that allows students to complete a variety of tasks to enhance their learning. This chapter will detail the university-wide implementation and the implications for academics in the University and Griffith Science’s Group. The university-wide implementation has been led by academics in the sciences who were already using other platforms. Their experience enabled academics to create superior learning designs to implement with this platform. Initially, academics were invited to be part of the university-wide Innovator Group which allowed for training and support to be provided throughout the year and on a just-in-time basis. Data is presented in this chapter from the university-wide implementation of both students and staff. Usage data over time is also presented. 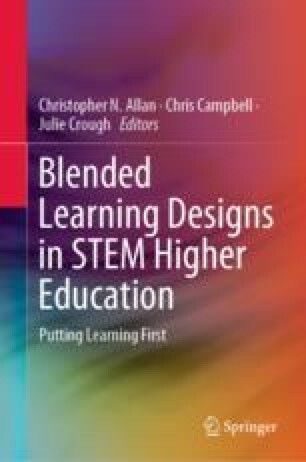 Overall, the implementation of PebblePad throughout Sciences has been successful with the uptake described in the chapter. Blair, H., Campbell, C., & Duffy, M. (2017). A multi-pronged approach to the enterprise-wide implementation of a personal learning environment. In Proceedings of 2017 ePortfolio Forum: Owning, Supporting and Sharing the Journey (pp. 9–17). https://eportfoliosaustralia.files.wordpress.com/2017/09/ebook_eportfolioforum_2017_papers_v1_20170907.pdf. Accessed 5 May 2018. Botterill, M., Allan, G., & Brooks, S. (2008). Building community: Introducing ePortfolios in university education. In Hello! Where are you in the landscape of educational technology? Proceedings Ascilite Melbourne 2008. http://www.ascilite.org.au/conferences/melbourne08/procs/botterill-poster.pdf. Accessed 20 May 2018. Campbell, C., & Blair, H. C. (2018). The role of professional Staff in the implementation of an ePortfolio system. In Proceedings of 2018 ePortfolio forum: Exploring, experiencing, engaging, energising, expanding (pp. 11–16). https://eportfoliosaustralia.files.wordpress.com/2018/10/2018-eportfolio-forum-ebook-of-short-papers-071018.pdf. Accessed 5th November 2018. Campbell, C., Bourke, J., Trahar, P., & Nisova, K. (2017). University-wide implementation: Supporting the innovators program and working collaboratively with faculties. In Proceedings of 2017 ePortfolio Forum: Owning, Supporting and Sharing the Journey (pp. 18–26). https://eportfoliosaustralia.files.wordpress.com/2017/09/ebook_eportfolioforum_2017_papers_v1_20170907.pdf. Accessed 5 May 2018. Campbell, C., & Korf, A. (2018). Supporting student learning through innovative technology in the aviation classroom. In ICICTE Proceedings 2018 (pp. 18–28), Corfu, Greece. http://www.icicte.org/assets/1.3_campbell_korf.pdf. Accessed 20 September 2018. Culatta, R. (2018). ADDIE model. http://www.instructionaldesign.org/models/addie/. Accessed 15 September 2018. Lorenzo, G., & Ittelson, J. C. (2005). An overview of E-Portfolios, EDUCAUSE learning initiative paper 1. https://net.educause.edu/ir/library/pdf/ELI3001.pdf. Accessed 6 October 2016. Pebble Learning. (2018). PebblePad features. Retrieved from https://www.pebblepad.co.uk/features.aspx. Smart, V., Sim, C., & Finger, G. (2015). Professional standards based digital portfolios vs. evidence based digital portfolios: Recommendations for creative, interesting and long-lasting digital portfolios. In Society for Information Technology & Teacher Education International Conference 2015 (pp. 1875–1882). https://www.learntechlib.org/p/150256. Accessed 30 August 2018. The University of Edinburgh. (2017). Why you should use PebblePad. https://www.ed.ac.uk/information-services/learning-technology/portfolios/why-pebblepad. Accessed 21 August 2018.